IHRC would like to welcome families and children for a fun and informative storytelling session with Sukaina Amirali Mukhtar. Sukaina will be reading from her latest book, Jabir and Nadia’s Strength. 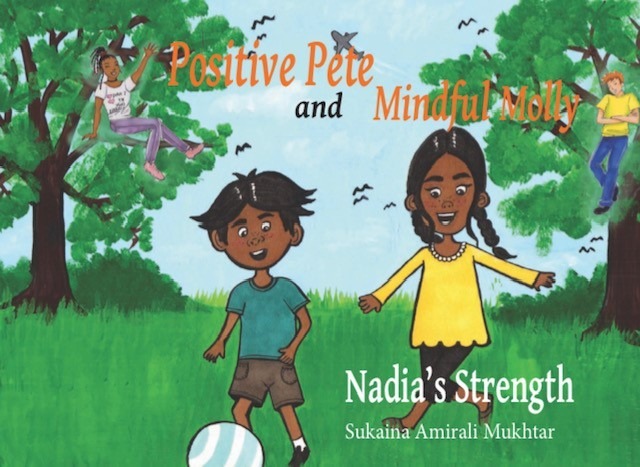 Jabir and Nadia’s Strength is a story about children who have to overcome challenges using various mindful methods that help them get back up again. Positive Pete and Mindful Molly represent the human conscience, who help the different characters along their journey. Nadia is a young and cheerful girl who becomes sick. Her illness affects her brother Jabir’s behaviour, who experiences a range of emotions, as his sister is in hospital. Jabir tries to overcome problems in school and still stay positive. The book will be available to purchase at the event. This event is suitable for children aged between 6 and 9. Sukaina graduated with a philosophy degree and went on to become a qualified teacher. In the classroom, she had always been passionate about helping her pupils with their emotional wellbeing. Creative writing was another underlying passion, and since she had a natural flair for it, she married the two together and started her own tutoring business. She tailors these small-group sessions to her pupils’ personality traits, incorporating skills in emotional intelligence through innovative methods in sensory storytelling and writing. She firmly believes in making learning fun by harnessing the powers of imagination and visualisation. Writing books is her way of reaching out to even more children around the world, to help them attain emotional independence through the realm of reality, imagination and mind tools. You can follow Sukaina on Instagram here.